These math games are designed to be used with one game board. Students practice math skills with different game cards. Each game has a direction card (student friendly) and set of cards. I print and laminate the game boards and cards for durability. I have included printer friendly game boards and cards for the color ink deprived . If you have to print everything in black and white like I do, you will appreciate these! 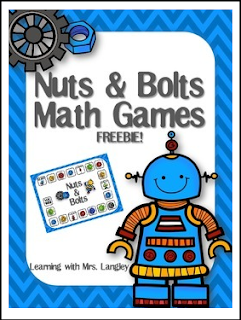 Every game has a recording sheet for added accountability for math centers. Need Morning Work? Try my Daily Math Review for 1st grade! Thank you for visiting my store. If you would like updates on new products and freebies follow my store.